Some centuries after the Jews were expelled from Jerusalem by the Romans, the Britons – ancestors of the Welsh, Cornish and Bretons – were driven from what is now England by the Angles, Saxons and Jutes. You might think of Logres as a purely mythical lost kingdom of Arthurian romance, but if you drive from Wales into England along the M4, you will see a bilingual sign that welcomes you both to England and to Loegr*. In this alternate history story, in which the Britons have come to reclaim their ancestral homeland, I’ve tinkered with the past to make the British situation a little more like the Middle Eastern one: I’ve had the Britons expelled by the Romans before the Saxons arrived, and given them a religion which tells them that Logres was bequeathed to them by God. The language they speak is Welsh, which I studied for a brief period when I lived near Bangor. If there are mistakes, let’s put it down to the fact this is a parallel timeline. Here’s an interesting programme about an Israeli journalist covering the real-life experience of being occupied. 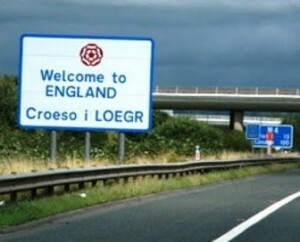 *The Welsh word for England is actually Lloegr, but it becomes Loegr if you’re travelling to it. In the same way Bangor becomes Fangor if you’re going to it, and Mangor if you’re in it. Languages are so gratuitously complicated!